We're so excited to introduce you to Rebekah Murray of Virginia Dare Dress Co. Rebekah is a kind and thoughtful creative who is not just a designer and entrepreneur, but is in the business of making women feel confident! From her photography and fashion background to her current role of Founder and Designer, Rebekah has always helped women look and feel their best. When she felt frustrated with the clothing industry and sensed that other makers weren't quote making clothing that made her feel her best, she stepped forward to fill that void herself! We love the message behind Rebekah's brand and we're so happy to share her with you! Oh hello! I’m the founder and designer of a women’s clothing company called Virginia Dare Dress Co. We specialize in dresses that are versatile, comfortable, feminine, and timeless. The company started because I couldn’t easily find dresses that were a little longer, for my age group, and fit my lifestyle. I want to help women live their best potential whether in work, in motherhood or in adventure and travel. What we wear has a huge effect on how we feel about ourselves, and I believe life gets more beautiful when we dress up for it--no matter our age or season of life. Our customers span a huge age range, and we love it that way! We also have a gift line with hand-lettered note cards, Maker and Baker aprons, and a couple new things coming in May. Our dresses and gifts are sold at some boutiques and mostly at our online store. The online shop launched just last May so we’ve been “open” for about a year. Originally we launched on Kickstarter the end of 2016, and it’s been an incredibly exciting dream to chase. I’m the designer; I also source fabric, work with manufacturers, visit boutiques to introduce the line, throw picnic parties, mail presents, take the photos, and lots of other really fun things. I love to work, and I hope that love shows. A million small things that never made sense at the time led me to where I am today. I unintentionally became a wedding photographer 11-12 years ago when an acquaintance of a friend of a friend got me a job interview right after high school, and my grandfather is a fashion designer and inventor in NYC’s Garment District. Buying a piece of cheesecake in Oxford, England led to a meeting with BRIDES Magazine which encouraged me to pursue fashion photography/lookbooks for clothing companies. Traveling around the UK more frequently brought such inspiration--the romantic feel of train views through the countryside and all the while, the frustration of not finding clothes that were modest, feminine, and just…”me” led me to create and build Virginia Dare Dress Co.
I’d also had a really rough few years relationship-wise and just knew I needed something more than weddings. Everything came together a few years ago when my mom suggested I start a clothing company, which, like nothing else I’d ever experienced, crystallized in my mind to the clearest future I could imagine. Looking for work attire, I kept noticing how difficult it was to find dresses that were more classy but still flattering, versatile, and simple enough for travel and work. A catalog/interviewee — not that they have to be friends with the person herself, but align herself with the kind of woman she is. 3. What brings you the most joy when designing and styling clothing? What brings me most joy is feeling that little spark and knowing that something speaks to me in that deeper way, more intuitively and not just mentally. A hard thing with designing is just how many options there are, and so what makes things special is when I somehow know that something is right. There is joy in truly wanting to wear a dress I’ve designed and knowing that I’m fixing a problem I’ve experienced over and over. I want what I do to have real value - that the clothes I design are needed in women’s closets and I can stand behind that with full conviction. When I feel that women need what I’m making because it will make their lives better, it’s such magic, really. It’s so fun to see how others make the dresses their own through styling and accessorizing, and that through their own personal styling, they feel free to be the best version of themselves. No matter how accomplished we are or how old we get, there’s an innate part of being a woman that wants to be beautiful. I’ve always struggled with self-confidence for all those mindless reasons we let influence our hearts, and when I see that in others I want so badly to help them let go of those hindrances. I love when customers send us photos or tag us online showing all the places and special events where our dresses have been worn. It’s surreal, and I hope it always feels that way. The day behind those photos is the goal of the company — what kind of days are lived in a VDDCo. dress - that’s what matters. Hopefully we help them feel (even more so) like they belong to the most beautiful days. Probably my greatest joy in my work is how creative I get to be on a daily basis. The designing, yes, but so much of the business side is all creative too - how operating expenses can be adjusted, how to do marketing in a unique way, what approach to take with stores, what team benefits we can have, what our packaging looks like, what words we should or should not use, and what goals to work towards. So much of it feels relational and creative, and I’m first in line to sign up for that. Sometimes I work just all the time, but other times I can take off at random. The most difficult part is that I run two businesses, and I can feel like I’m drowning a good bit of the time. This results both from the amount of things to be done and feeling far out of my depth with making decisions and leading the company. I think the most difficult thing is that I’m not always the person I want to be. Seeing the gap in discipline, management, and communication for where I want to be as a designer, I can question my abilities as a boss, a leader, and some days I simply get sidetracked and waste an afternoon. It’s hard when you know your faults and you see them standing in the way of all that you want for your company. I think it’s a really common discouragement for entrepreneurs, and being more disciplined to work when you should work and play when you should play helps keep us from burnout. “Take time off, honestly” was good advice I heard once. Business to me feels like quantifiable relationships. That personal aspect of it plus flexibility are probably my favorite aspects of being an entrepreneur. The things that are part of my work - studying marketing, finance, fit, metrics, customer feedback, colors, and picnics (a personal favorite) keep me excited and constantly on my toes. I love to think - I need to spend a lot of time thinking through ideas before they’re ready in real life. Learning really helps. Whenever I start to feel fearful of running out of ideas (and that strange hoarding feeling comes in where you don’t want to use up too much creativity since you might not have any left for later?) the best help for me is to dive into reading books written by innovative people. This practice unlocks a new world of things I hadn’t thought before, and creativity flows again. My parents homeschooled my brothers and me, and that free flowing mentality has been a big part of it. I grow personally by making time for what’s important. For me that’s my family, my church, hospitality, doing impulsive things for the love of it, and ideally one big trip a year. Professionally it means reaching out to people who are higher up and asking for advice in a way that feels okay. Pride is detrimental to success, so talking with people much more experienced helps me keep it all in perspective. I want to stay Hungry, Humble, and Kind. Ideally: read a little, (I avoid business books at night since then I get FOMO, which is terrible for sleep). I also write down 3 things to do the next day. It sometimes turns into a full page list. Recently I’ve started using a real alarm clock instead of my phone. This keeps me from picking up my phone in the morning and instead, I try to avoid email/social media until later in the day, often 11am or noon. On an off day, (again, discipline!) my nighttime routine is scrolling Instagram and passing out by midnight. 7. What’s one piece of advice you would give to other entrepreneurs in your industry? Be patient. When you’re so attached to your work, you can’t understand why hundreds of people aren’t lining up to have what you design or what you make. Just because growth isn’t as fast as you hoped for doesn’t mean it’s not there. Also, seek out experts. Optimism isn’t always your friend, and you need to be continually learning and getting some honest feedback to assess your weak points. The more you know what can be better, the better it can be. We want the identity of being good at our job so we can ignore things that conflict with that. Admit to weaknesses when you need to for the sake of the Work. Also, remember that today is the IT you’re working towards. You will never wake up in a tomorrow-land feeling of life - it will always feel like a Today, a day full of ordinary excitements, discouragements, and variable amounts of caffeine. Just because life isn’t perfect right now doesn’t mean that you should miss out on realizing the significance of exactly where you are! Own it. Love it. Be thankful for it. And keep working for another today tomorrow. Thank you so much Rebekah, for sharing your thoughts and wisdom! 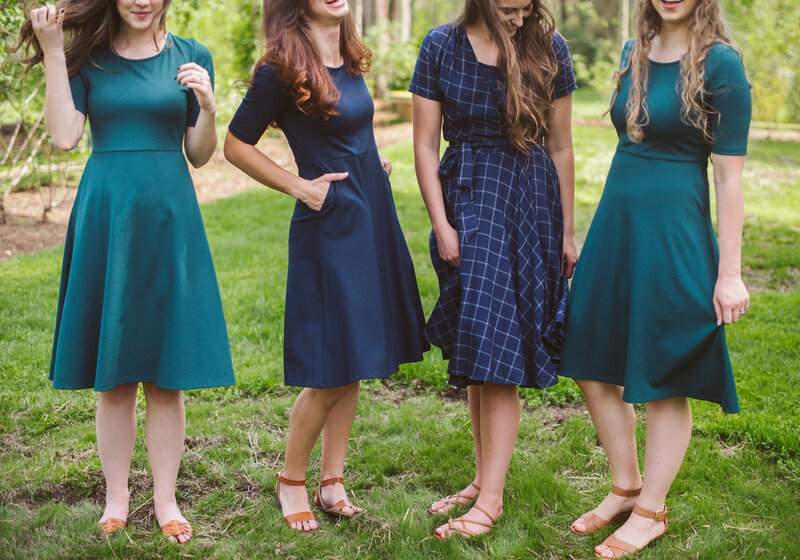 You can follow Virginia Dare Dress Company here and here!